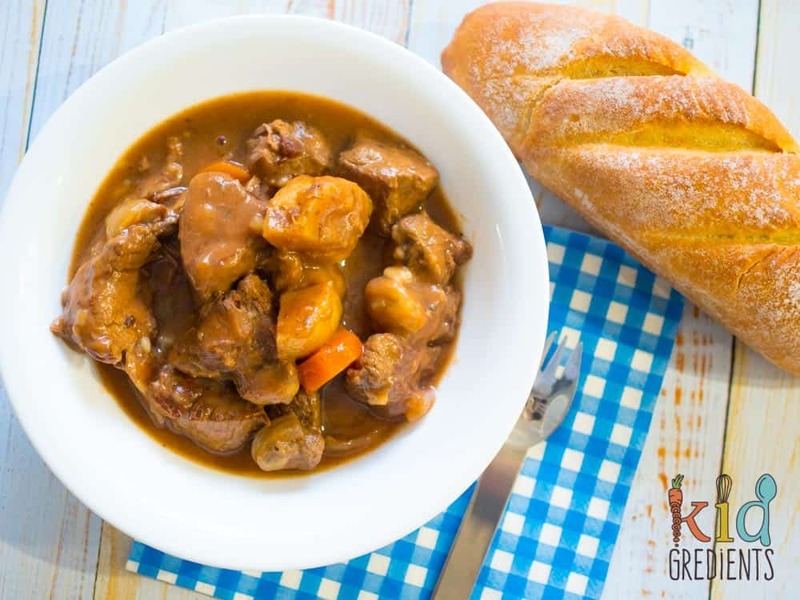 When it comes to cold weather, you can’t look past a hearty slow cooker beef stew! It’s perfect for warming up cold kids and adults too! It packs a flavourful punch and is perfect set and forget cooking. Use a cheaper cut of meat to make dinner just a little more budget! 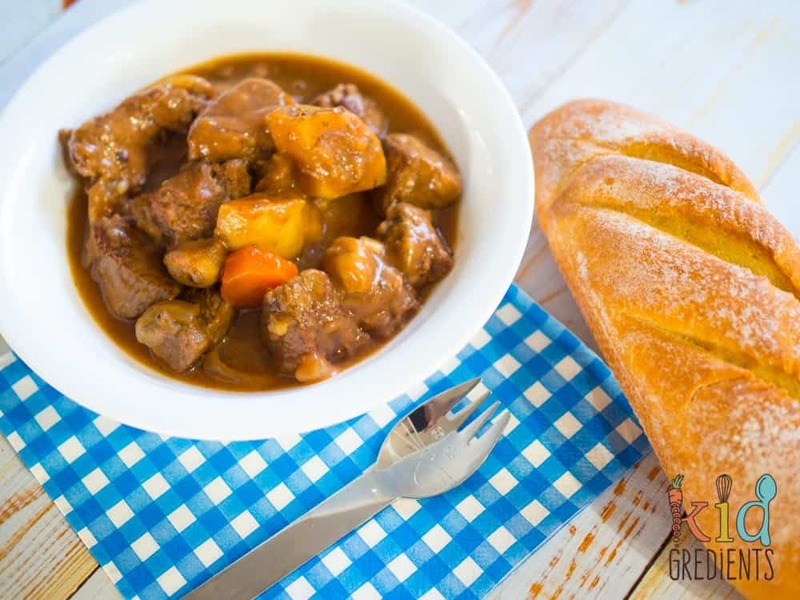 Beef stew reminds me of winter in the UK- a proper winter, where I get to wear something other than flip flops and sandals! I love the fact that it makes you feel warm and cosy and that it tastes even better with a glass of red wine. In fact I find it quite hard to find something I don’t like about beef stew. Now, you need to brown the beef in this recipe. It helps to give it a much more flavourful base. It is a really important step. I can’t stress how much it adds to the flavour profile of this dish. Basically if you don’t brown the beef, it tastes stodgy. And nobody likes stodgy stew. The kids, loved this dish, it was perfect for an evening when it was cold and miserable and is also excellent because if you have leftovers, they taste awesome baked into a pie! 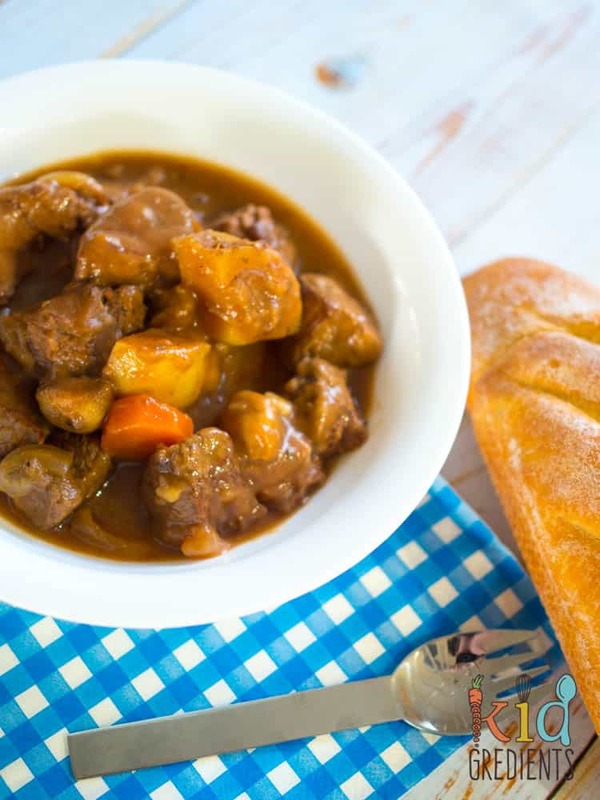 Just putting it out there…it’s incredibly hard to photograph beef stew (or any other brown food) and not have it look like dog food. So, please disregard the fact that this doesn’t look amazing. What it lacks in gorgeousness, it makes up for in taste! So grab some crunchy bread, and a glass of red and enjoy your dinner tonight. Packed with veggies and yummy stuff. 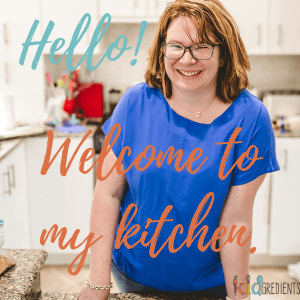 Looking for more slow cooker meals? Check out our slow cooker book! 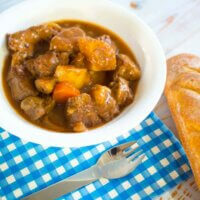 Hearty slow cooker beef stew, perfect for a winter's night and delicious with crusty bread! Put the beef in the slow cooker. Add onion and garlic to the pan and fry until soft. Add to the slow cooker. Add the mushrooms to the pan and fry until golden. Add to the slow cooker. DE-GLAZE TIME! (Read more about this important step in the post!) Add the water from the porcini mushrooms and the tomato paste to the hot pan. Swill it all around and then pour into the slow cooker. Add the carrots, potatoes, stock, bay leaves and italian herbs and the porcini mushrooms to the slow cooker. Push everything down in under the liquid and set to low for 7.5 hours with the lid on. Or high for 4.5 hours. Open the slow cooker and remove 1 cup of the liquid. Stir the flour into it and then return to the slow cooker, mixing through. Cook for 1/2 and hour on high with the lid off.